The IOA and the CHS address an open call for papers to young researchers who wish to present their work at the 2019 Symposium. 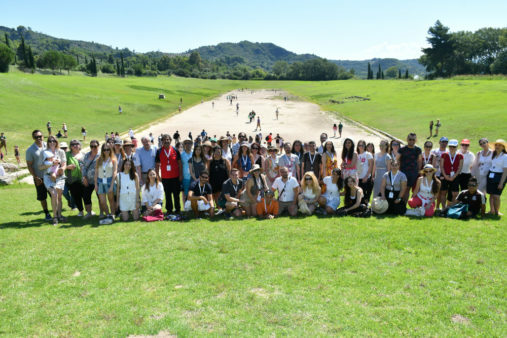 “Language and Athletics: The Many Discourses of Sport” is the topic of the Eighth International Scholars’ Symposium, due to take place on 10-14 July 2019, in Ancient Olympia, Greece. The International Olympic Academy (IOA), in cooperation with Harvard’s Center for Hellenic Studies in Washington DC, and with the support of Harvard’s Center for Hellenic Studies in Greece, is organizing the Eighth International Scholars’ Symposium in the “Sports, Society, and Culture” series in Ancient Olympia, July 10–14, 2019. As in previous years, the Symposium will host scholars from around the world and bring together students and faculty from Universities in Greece and abroad. Building on comparative aspects of earlier themes in the series, the topic of the 2019 Symposium is “Language and Athletics: The Many Discourses of Sport.” As part of the international scholarly exchange on sports, society and politics, the 2019 meeting of the IOA/CHS Symposium examines the multiplicity of discourses pertaining to language and athletics. By exploring the verbal and non-verbal articulation of Olympic contexts, this year’s conference brings to Olympia an academic gathering designed to shed new light on the dialogue between the ancient and modern Olympics. The Symposium is addressed to third- and fourth-year undergraduate students, as well as postgraduate students – Masters students and PhD candidates – from these departments, which span the disciplines of Sport Sciences, Humanities and Political Sciences in Greece and abroad. Priority will be given to first-time participants. For the first time this year, the IOA and the CHS are also addressing an open call for papers to young researchers who wish to present their work at the 2019 Symposium. Masters students and PhD candidates are invited to submit abstracts on this year’s topic “Language and Athletics: The Many Discourses of Sport” for participation in a graduate student panel. This is a non-fee based event, and the participants will be given certificates of attendance during the closing ceremony of the Symposium. For additional information, we encourage you to visit the Symposium’s website! The IOA and the CHS address an open call for papers to young researchers who wish to present their work at the 2019 Symposium. Postgraduate students (Masters students and PhD candidates) are invited to submit abstracts on this year’s topic “Language and Athletics: The Many Discourses of Sport” for participation in a graduate student panel. The evaluation will be made by the Symposium’s Academic Committee and the participants/guest presenters will be notified via e-mail by mid-June. For additional information please contact Ms. Marilena Katsadoraki, IOA Sessions’ Coordinator, by telephone (+30 210 6878810, Athens, Greece) and/or email m.katsadoraki(at)ioa.org.gr, and/or Ms. Christina Lafi, CHS GR Projects and Content Development Manager, by telephone (+30 27520 47030, Nafplio, Greece) and/or email clafi(at)chs.harvard.edu.